The soft energy is used in Reykjavik to heat the buildings and it seems that this heat would be even enough to fill the residents and visitors of the city with optimism. One of Iceland’s peculiarities is that the clean and curative water of natural geothermal springs flow from the water supply pipes. Maybe that is the reason, why the Icelanders remain young and beautiful for so long? In addition, there is none special equipment for the water heating – the nature has taken care of it. 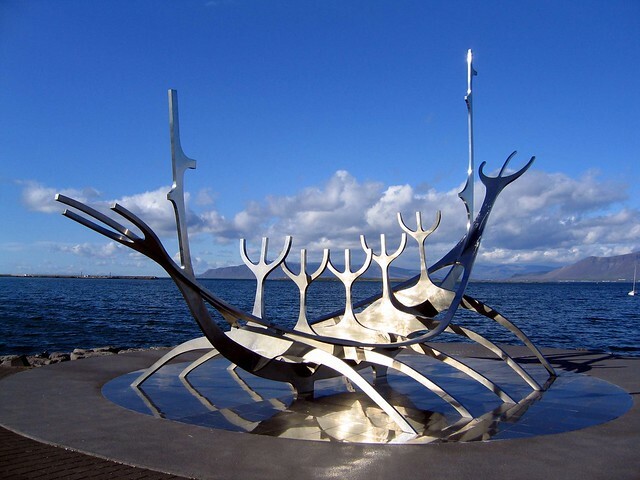 When Ingolfr Arnarson sailed to Iceland at the end of the 9th century and founded the first settlement there, he named the place Reykjavik (“The smoking harbor”) because of the numerous hot springs with the rising steam. If you want to combine the pleasant with the useful in Reykjavik – to watch the city and to improve your health, we suggest you to visit the Fish Spa Iceland and to swim in the hot springs of the Blue Lagoon. Rent a car at Keflavik International Airport and it would be not difficult to reach one more place, where you can enjoy plenty of warm water under the open sky – the Nautholsvik beach. Since only the most desperate bathers, who have conditioned themselves to the cold, dare to bathe in the sea, it was decided to create the so-called “thermal beach”. For this purpose, a place in the Nautholsvik Bay was chosen: the hot water of the springs meets with the sea, turning the icy seawater into the water, where it is very pleasant to swim. The Blue Lagoon is located on the Reykjanes peninsula, in the south-west of the country. It is formed mainly from blister lava. The pass to the complex is cut down in the lava. The hot curative waters rise up to the surface, then they get into an artificial lagoon and the spa center. The width of the lagoon reaches 200 meters, the depth is from 1 to 3 meters, and the length is several kilometers. The water in the pool seems to be blue, but on closer examination, it turns white. The lagoon has a smooth clay bottom. On the shore, there are several steam rooms. When you are in the water, you may smear skin with clay, which is having a positive effect on your health. Thousands of travelers come to the country just for the Icelandic hot springs, as bathing in geothermal pools is recommended not only by cosmetologists, but also by medics. These hot springs are having unique healing properties due to the minerals, sea salt, sulfur and blue-green alga. These substances have a beneficial effect on the skin and they could heal various dermatological diseases. According to one legend, these healing properties were discovered by one of the Icelandic power engineers, and this happened quite by accident. Bathing after a day’s work, the man was surprised to find out, that his psoriasis was cured. In the early 1990s, the local residents began to bathe in this small blue lake near the power station. Due to the popularity of the place, the local authorities decided to build a platform and the places for changing clothes. In 1999, a top grade SPA-complex was built here. It includes thermal baths, a bar, restaurant and a shop, where visitors can buy locally produced cosmetics. In the lagoon, there are bridges and waterfalls for the entertainment of visitors. The spa complex in the Blue Lagoon abut with the clinic that specializes in the treatment of dermatological diseases. It was opened in May 2005. Unique methods of treating psoriasis are offered here. The Blue Lagoon is one of the main places of interest in Iceland. It is a worldwide famous geothermal basin, which is unique. There are no more such places on our planet. This lagoon is considered a landmark of Iceland and it attracts a huge number of tourists from all over the world. 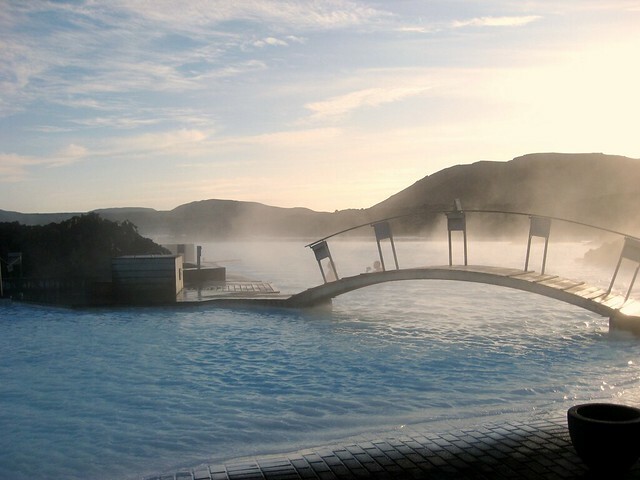 In 2005, the Blue Lagoon became the world’s best spa resort. Due to the unique composition of water, the inimical bacteria simply do not survive in it. Mineral salts are stimulating the improvement of the whole organism. The water of the lagoon is also saturated with quartz, silicon, green and blue alga. Therapeutic muds contribute to deep cleansing and healing of the skin, alga is having a softening and nourishing effect. The best time to visit this resort is considered a cloudy, windy weather. This is because the water in the lake is too hot. When the air temperature is cool enough, it is nice to take a dip in hot water, after being on freezing air. Bathing in geothermal water helps to increase the skin tonicity, helps to prevent cellulite and skin diseases. It is having a relaxing effect. It reduces stress and improves overall health. Mineral salts are having therapeutic and restorative effect on the entire body. From September 1 to May 31 – 33 euros (adults), 15 euros (children 14 and 15 years). From 1 June to 31 August – 40 euros (adults), 15 euros (children 14 and 15 years). Children under 14 years come for free, together with an adult. Fish Spa Iceland was opened in summer 2013. It was the first Fish Spa in Iceland. It is a perfect place for those, who take care for their body and soul. The innovative treatment is given in the way, free from any harmful bacteria. For this purpose, the special equipment sterilizes the water continuously, keeping the tank-aquarium clean. The Garra rufa fish, which are used for the procedure, are small freshwater fishes, which maximum length reaches 10 centimeters. They are very popular all over the world for their ability to give delicate micro massage, which is a highly effective anti-stress treatment. The name of the fish is translated as a ‘fish-doctor’. 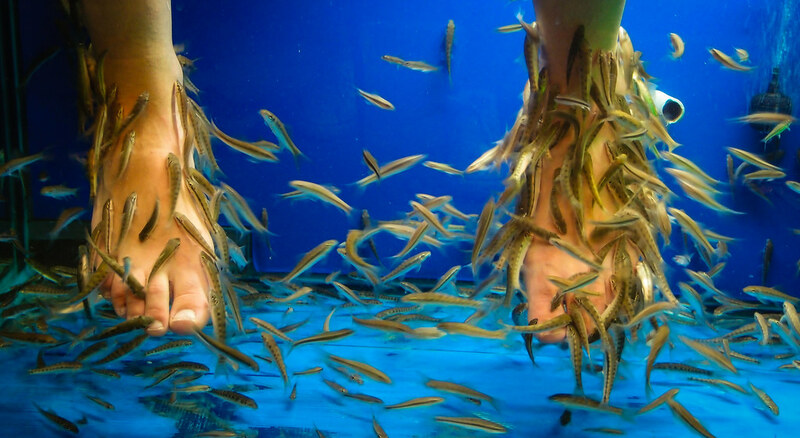 For the procedure, most often legs or hands, less often – the entire body, are immersed into a tank-aquarium with warm water and the fishes. In water, the skin softens, and the fishes begin to remove the keratinous layer and the affected areas of the skin, improving the microcirculation of superficial skin layers and enhancing skin regeneration. First, you can feel tickling, but in a few minutes, the body gets used to it and that feeling disappears. The fishes are processing the skin very gently and only in places where it is necessary, besides, you are having a micro massage. The peeling of the legs is the most popular, as a lot of nerve-endings are concentrated on the foot. Having this procedure, a general beneficial effect on the body is achieved as well. Initially, fish peeling was not a cosmetic procedure, but one of the treatment means of such diseases as psoriasis, vitiligo, neurodermatitis, tetter, fungal disease and acne. In these cases, the effect of fish peeling is significant, as most patients are having a remission for six months or even more. The fish peeling improves blood circulation, has a sedative effect on the nervous system, comforts legs and reducing puffiness. Moreover, the skin becomes smooth, soft and silky. After the peeling, the pedicurist takes care of the nails, but only for some minutes, as the fishes have already done the main work. Duration of the whole procedure is from 15 to 30 minutes. Previous article What Will Be The Future Of Mobile Application Development Industry?